An acknowledgement for the use of the maps is shown on the History Home page. The maps can be viewed enlarged by going to the foot of the page, clicking on an image which will provide a slide show. 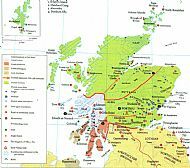 After the departure of the Romans from Britain, Scotland consisted of four main kingdoms – Dalriata (Scots), Pictavia, Strathclyde (British) and Lothian (Angles). 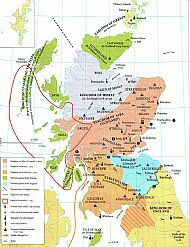 From the 8th Century there were attacks by the Vikings in the North and West of Scotland, followed by Norse settlement. Eventually in the 9th Century, Kenneth MacAlpin became King of Alba, formed from Dalriata and Pictavia. 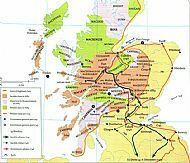 By 1034, the King of Alba had conquered Lothian and obtained Strathclyde by marriage. At the same time Gaelic-speaking chieftains emerged in the North and West. One of these was Somerled of the Isles (1100 to 1164), who fought to drive the Vikings out of Scotland. 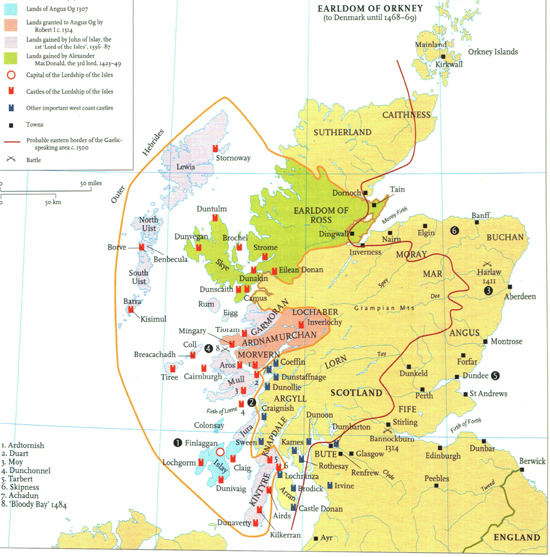 The Western Isles were ruled by Norway until 1263. In that year, the forces of Alexander III defeated the forces of King Haakon of Norway at the Battle of Largs and the Western Isles were ceded by Norway to Scotland. A grandson of Somerled was Donald, who was the founder of Clan Donald. 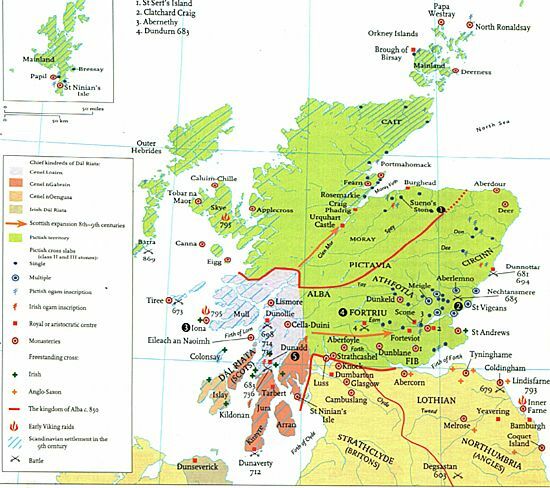 At first Clan Donald ruled places in the mainland, e.g. Kintyre, Morven and Ardnamurchan, with the island of Islay. Angus Og MacDonald, Lord of Islay, was a grandson of Donald (the founder of Clan Donald) and a great great grandson of Somerled. Angus Og assisted Robert the Bruce in his quest to be King of Scots. At the Battle of Bannockburn in 1314, Angus Og and the men of the Isles fought in support of King Robert the Bruce and helped him win the battle. As a result, Angus Og received the Lordship of Lochaber, with Durrour and Glencoe as well as the islands of Mull, Jura, Coll and Tiree. Angus Og was succeeded by his son John of Islay. 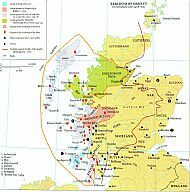 By marriage, John of Islay obtained the territory from Knoydart to Moidart and the islands of Eigg, Rhum, Barra, Uists and St. Kilda. He became the first Lord of the Isles and when he died in 1387, he controlled the whole of the Hebrides from Lewis to Islay (except Skye). And also the mainland from Kintyre to Moidart. One of John’s sons, John Mor, married an Irish heiress from Antrim and brought new territory in Ireland to Clan Donald. At the Battle of Harlaw (1411), Donald, 2nd Lord of the Isles, attempted to uphold his wife’s claim to the Earldom of Ross. Their son, Alexander, 3rd of the Isles, was recognised as the Earl of Ross, including Skye, in 1438. 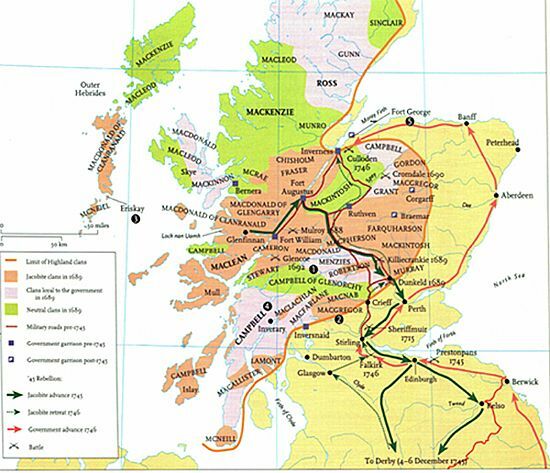 Clan Donald’s attempts to increase power by intrigue with the English crown brought conflict with the Scottish kings. John, 4th and last Lord of the Isles, was forced to forfeit his title to James IV in 1493. During the next fifty years, there were many risings by leaders of Clan Donald to restore the lordship, but all were unsuccessful. Since then, the heir to the throne has always held the title, Prince Charles being the present Lord of the Isles. The Union of the Crowns took place in 1603 in the reign of James VI. During the reign of his son, Charles I, conflict developed between the King and Parliament. During the English Civil War, the Scottish Covenanters, led by the Duke of Argyll and the Campbells, supported Parliament. Therefore, Clan Donald and allies supported the Marquis of Montrose and the Royalists. The defeat of Montrose in 1645 at Philiphaugh ended the war. However, Montrose returned in 1650 to organise a rebellion against Cromwell, but was defeated, captured and executed. After the accession of William III and Mary II in 1688, there was a rebellion in Scotland, led by Viscount Dundee. He routed Government troops at the Battle of Killiecrankie (1689), but Dundee was fatally wounded and the rebellion petered out. It was decided that the Highlands should be pacified. All clans loyal to the exiled James VII and II had to take an oath of allegiance to William III. The rebel chiefs reluctantly submitted, but MacIan of Glencoe delayed and was a week late in taking the oath. It was decided to make an example of the clan and soldiers under the command of Robert Campbell of Glenlyon were sent to Glencoe. There they enjoyed the hospitality of MacIan and the MacDonalds for two weeks. Then, in the middle of the night of 13 February, 1692, Glenlyon and his men murdered a number of MacDonalds, including MacIan. The Massacre of Glencoe helped the Jacobite cause. In 1707, the Union of the Parliaments took place. By 1714, Queen Anne was dead, all her children having died before her. Not long after, George I (the Elector of Hanover) was declared king and there was a Jacobite Rising in Scotland in 1715, which proclaimed James Edward Stuart king at Braemar. The Jacobites marched south, took Perth, and fought an indecisive battle at Sheriffmuir. As winter was approaching, the Highlanders deserted the cause and the uprising ended. However, the Jacobite cause was not dead. In 1745, Charles Edward Stuart landed in Scotland to make his father king. Many clansmen joined his forces and he marched south and took Edinburgh. Then he routed Government forces at Prestonpans. Afterwards he captured Carlisle and marched south to Derby. There he was obliged to retreat back to Scotland. He defeated another Government army at Falkirk (1746) and retreated to Inverness. Charles Edward Stuart was finally defeated at the Battle of Culloden in less than one hour. After the battle many clansmen were killed, whether wounded or not. The Government introduced some laws to prevent another rebellion. The wearing of the tartan and the kilt, having arms, and having the bagpipes were banned. Many Jacobites were executed, others died in prison, and more than 1,000 were transported to the colonies in North America. The Government destroyed the power of the clan chiefs. Within 20 years, however, many Highlanders, including Macdonalds, joined the British Army and the Highland Regiments have served successfully ever since. There was much emigration from Scotland in the 18th and 19th Centuries. Between 1770 and 1815, 15,000 Scots, mainly from the Highlands and Islands, emigrated to North America. Later in the 19th Century, thousands more emigrated, as a result of the Clearances, to the USA, Canada, Australia and New Zealand.